I live on a small island approximately 12 miles off the coast of Maine. You can imagine that because of my location, I often don’t have access to every ingredient a recipe calls for; therefore, I often look to recipes for inspiration and ratios and create my own with the ingredients I have on hand. My friend called a few days ago and asked if I would like to come over for sushi dinner and asked if I would bring a salad. I never pass up sushi, so I immediately accepted the invite, and then I went to my pantry, refrigerator and freezer to figure out what I could make to go with the dinner. I had recently been craving the Vietnamese Goi Bo and had picked up a bunch of fresh mint for the dressing, but wasn’t sure if I had all of the other ingredients. Using the full recipe as the inspiration, I left out the beef and mushrooms and added in local kelp that I had in my freezer, figuring these flavors would make a nice complement to the sushi. Blend all ingredients in a blender until well incorporated. 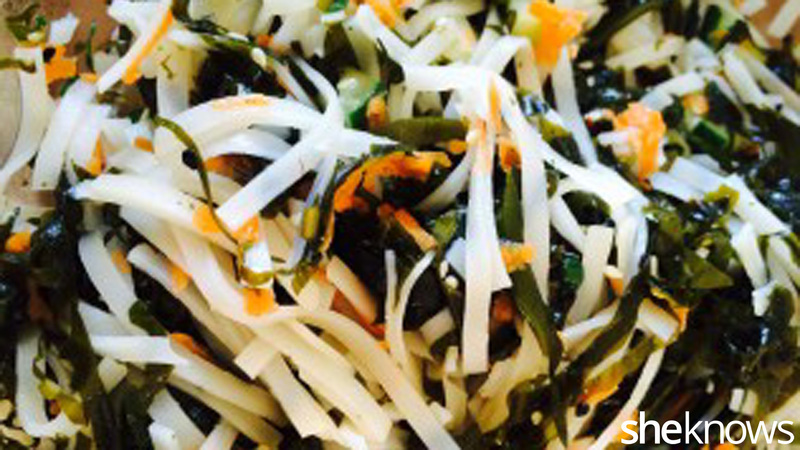 Place the kelp in a medium glass or stainless steel bowl. 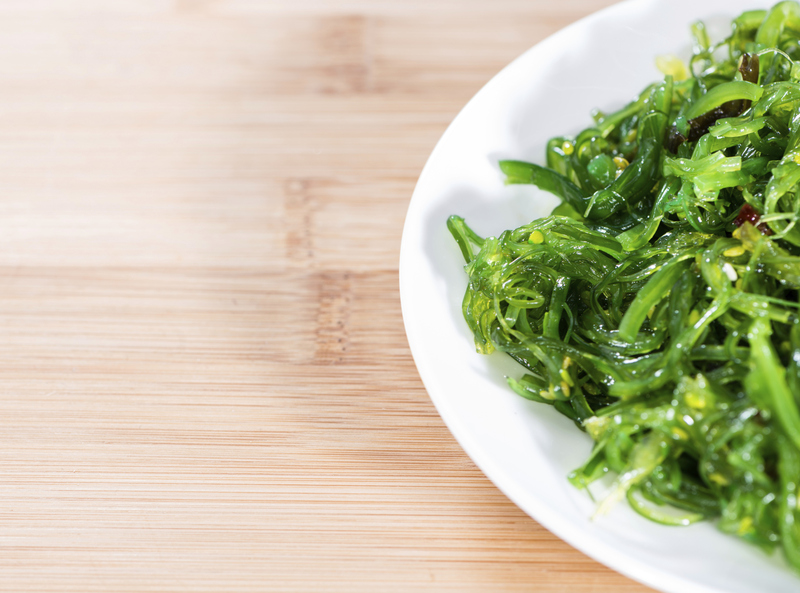 Use your fingers to pull the kelp apart so that it isn’t clumped. Roughly chop the rice noodles so they are bite size. Use your hands to integrate the kelp and noodles. Add cucumber, carrot, scallion and sesame seeds. Toss together. Pour dressing over the salad and work through. Make at least a couple hours ahead of time for the flavors to marry. Before serving, taste and adjust the seasonings. Add more soy sauce, sesame oil, ginger, chili paste or other herbs to taste. Serve with steak: Marinate tri-tip steaks in the dressing for at least 1 hour, grill to medium-rare and thinly slice on top of the salad. Serve with chicken tenders: Poach the chicken tenders in 1/2 inch of dressing for 6–8 minutes or until cooked through. Chop and serve on top of salad. Serve with tofu: Dry the tofu out completely. I like to leave mine out most of the day near a heat source to dehydrate the tofu as much as possible. Press the water out using clean towels or paper towels. In a dry pan, cook 1/2-inch thick x 1.5-inch wide slabs until browned. Toss in the dressing before serving. After making all of these substitutions and additions, the dish no longer resembles the original, but the essence and inspiration are clearly there. The fresh, bright flavors that are associated with Vietnamese foods as well as the variety of texture are present. Vietnamese food is known for appealing to all the senses. With the bright colors, varied textures, zesty aromas, delightful crunch and fresh flavors, this dish hits the mark. Try making the original recipe, my creation or create your own inspired dish.